Porto clinched the Portuguese league title with a 2-1 "classico" win over rivals Benfica in Lisbon to protect their unbeaten run this season. Coached by Jose Mourinho's former protege Andre Villas Boas, the win left Porto 16 points ahead of second place Benfica with five games to go. Fredy Guarin gave Porto a ninth-minute lead before Javier Saviola equalised with a 19th-minute penalty. 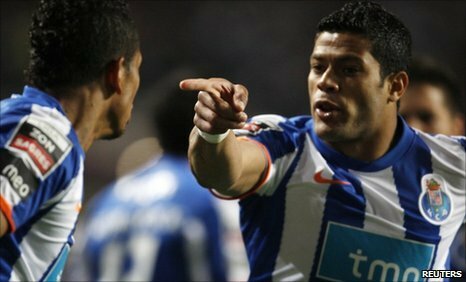 But Hulk's penalty soon afterwards ensured Porto took their 25th title. Last season's champions Benfica helped Porto on their way when keeper Roberto fumbled Guarin's cross into his own net. However the home side were quickly level when Argentine defender Nicolas Otamendi fouled compatriot Franco Jara and forward Saviola converted the penalty. Porto regained their lead when Guarin freed Colombian Radamel Falcao, who was brought down by Roberto, with Brazilian forward Hulk firing in the spot-kick. Both teams ended the game with 10 men, with Otamendi sent off for a second booking, while Benfica striker Oscar Cardozo was red-carded late on for lashing out at Fernando Belluschi. Porto, who face Spartak Moscow in the Europa League on Thursday, have dropped just four league points in a remarkable campaign for the 33-year-old Villas Boas in his first season in charge. "We showed who plays the best football," said Villas Boas. "This was constantly ignored, on a daily basis by everyone so our cry of revolt against that helped us, with merit due to the players, to win the title." Boas' team, who went on an 36-unbeaten game run before a Portuguese cup defeat by Nacional in January, would become only the second team in the league's history to complete a season undefeated if they avoid defeat in their remaining games. Benfica were unbeaten in the league during the 1972-73 season.